As hurricanes, floods and wildfires ravage the Earth with unprecedented ferocity, it seems the desolation of humanity is fast approaching. Despite the imminent threat of irreversible climate disaster, the U.S. government remains unconcerned with what is shaping up to be the end of the world. 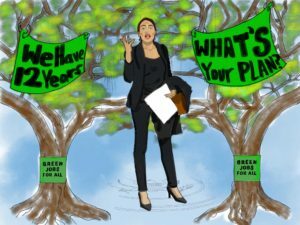 In 2019, as atmospheric temperatures climb to catastrophic highs, it is imperative the Green New Deal (GND) becomes the focus of contemporary politics. Young activists are advocating for the policy because their lives are on the line as long as carbon emissions continue to rise. They recognize a complete policy overhaul is needed to create a carbon neutral economy — the only way to stop climate change from getting worse. The baby boomers won’t do it, so we must demand solutions now. The GND would guarantee millions of jobs in sustainable energy with a living wage. It would take power away from big banks on Wall Street and increase public control of money supply and credit. The GND would also protect the rights of citizens by enacting a Voter Bill of Rights and reverse corporate personhood, a landmark decision promoted by lawmakers in corporations’ pockets. The GND is a radical solution to conventional systems of advanced capitalism, which have failed to address climate disasters already displacing millions. In the past, Democrats proved their inability to create policies that would prevent further climate disaster. In a post-Trump era, activism from democratic socialists and youth activists places pressure on establishment politicians to enact radical updates to environmental policy. Activists recognize economics and social inequality are intricately connected. It should be illegal for the super-rich to condemn everyone else to a second class life. Dedicated to an equitable, sustainable economy and reversing the damage already done, the Sunrise Movement is a group of young activists demanding reform. Their rhetoric maintains that the people who are most affected by climate change are poor, marginalized communities and the biggest culprits of land and atmospheric pollution are billion dollar corporations obsessed with making a profit at any cost. We must not let corporations continue to dictate who lives and who dies. On her first day in office, New York Rep. Alexandria Ocasio-Cortez proposed the formation of a select committee tasked with taking steps toward making the GND law. Only 45 members of the House currently support the formation of the select committee. Santa Cruz representative Jimmy Panetta is not included on that list, a telling absence that reveals the complacency of politicians in self-proclaimed progressive counties. Congress must put aside political views and face the reality that the Earth simply cannot support American habits any longer. Politicians treat environmental issues as partisan and polarizing, but climate catastrophe will pay no attention to party lines. The House must create a select committee on the GND, no matter how difficult or expensive, because the alternative is an uptick in the fires, droughts, hurricanes and other disasters already devastating the country. Leaders of the Sunrise Movement insist that politicians consider climate justice and how economic and social inequality forces poor and marginalized communities to bear the brunt of climate change. Sunrise youth activists, inspired by movements like Occupy Wall Street and Black Lives Matter, refuse to accommodate centrist legislation or lenient negotiations which result in environmental policy designed to protect corporate interests. The young people of today will be forced to make up for the irresponsibility of previous generations. With forecasts from climate scientists predicting 20 years or less before global catastrophe, the climate crisis is well past a state of emergency. The time to demand change is now. Honestly, it was 50 years ago, but now is our best bet. The Green New Deal is radical, but only because so far our democracy fails to see the urgency with which climate change must be addressed. Progressive policies like the GND may be costly, but the costs of mass extinction, extreme weather and irreversible pollution will be far more devastating. Call your representatives to demand their support for the Green New Deal, get involved with Sunrise Bay Area and participate in local climate justice demonstrations. With persistence, it is possible to pressure Congress to make promises to protect the future of Earth as we know it. We should not live in fear that our houses will burn, that our cities will flood, our children will not be able to breathe without masks. This is our only planet. We have a solution in front of us. What will we do now?